Recharging an air conditioner involves replacing or topping off the coolant. Your air conditioner only needs to be recharged if coolant has leaked out, if you have replaced a part on the air conditioning unit, for inadequate sub-cooling, or if you are installing a new system. Only top off non-azeotrope coolant (for azeotrope coolant you have to completely drain the lines and fill them with new coolant). Use the high pressure method (see below) for units with capillary tubes. For air conditioning systems that do not use capillary tubes, use the low pressure method. Look up the type of coolant used in your air conditioning system. Check the manual or call the manufacturer. Then purchase the coolant from the manufacturer or a hardware store. Attach the coolant canister to the hose connected to the center manifold’s pressure gauge. Drain the lines. Throttle the plain gauge’s regulator and the coolant cylinder’s regulator. Close the regulators after the lines are empty. Attach the hose connected to the plain pressure gauge to the service valve of the liquid line and take out the protective cap of the service valve. Slightly open the plain gauge’s regulator, and throttle the coolant regulator. 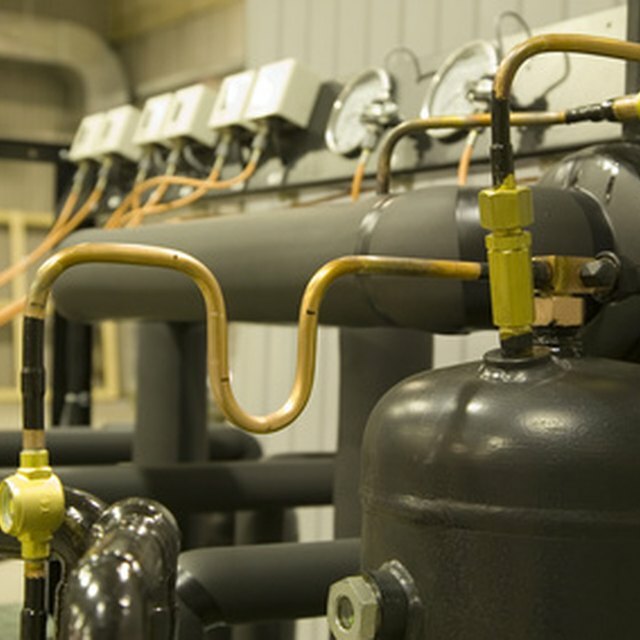 When the high pressure side reaches the recommended level, shut the coolant’s regulator. Turn on the air conditioner. Check the sub-cooling levels and the sight glass. If it is clear, you are finished. If there are bubbles, or the sub-cooling is not 10 degrees Fahrenheit, repeat Step 6 and recheck until adequate. Throttle the compound gauge’s regulator and the coolant cylinder’s regulator to empty the line. Make sure you take out the service valve’s protective cap. Slightly open the compound gauge’s regulator and throttle the coolant’s regulator. Run your air conditioner. Close the coolant's regulator when the low pressure gauge is at manufacturer recommended levels. Check the superheat for 10 degrees Fahrenheit and to see if the sight glass is free of bubbles. You should be finished at this point.